Home › Life › fun & hobbies › ‘Tis the season for festive food! ‘Tis the season for festive food! My 11 year old and I were discussing recently what we might give to his teacher for a Christmas/end of year gift this year. Mr M is a lovely young bloke and this has been his first year of full time teaching, so I figure he’s likely to enjoy getting individual gifts from the kids as much as, or even more than the “collect money from everyone and buy a big gift” present that teachers are traditionally given at my kids’ school. Apparently I’m not the only one who had reached that conclusion and Mr 11 tells me that the baked gifts have been arriving already. Mr M has been enthusiastically greeting these offerings with the comment “Oh wow, I’m going to get fat!” So I’m rather tempted to send him some fruit mince pies decorated with icing sugar dusted through Definatalie’s “No Diet Talk” brooch. 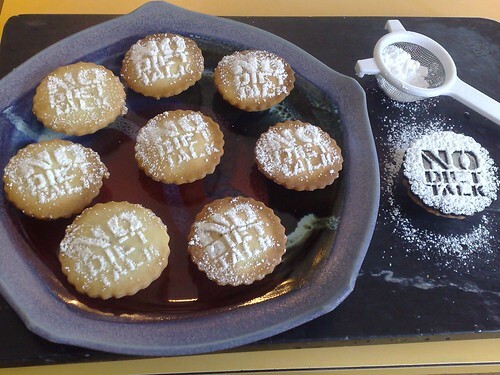 Fruit mince pies with icing sugar text “No Diet Talk” dusted onto the tops. 1. Preheat the oven to 180°C (170°C for fan-forced). Brush 3 12-cup shallow patty tins lightly with melted butter. 2. Place flour, sugar and butter in a food processor. Process until the mixture is fine and crumbly. 3. Add the water and process until the mixture comes together (start with 3 1/2 tablespoons, add a little more if needed). Turn onto a lightly floured surface, knead very gently until smooth. 4. Roll out 1/2 the pastry (about 1/4 at a time is manageable, I place baking paper over the top so it doesn’t stick to the rolling pin) and cut with a round biscuit cutter. Fit the circles into prepared tins. 5. 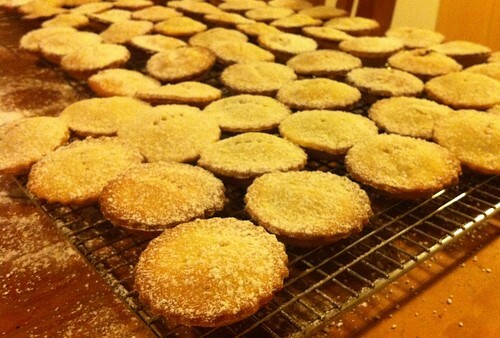 Fill pastry cases with fruit mince – don’t overfill, a slightly heaped teaspoonful is about right. 6. Roll out the remaining pastry, cut with the same cutter and place the circles on tops of the pies, press the edges to seal, prick with a fork to let steam escape. 7. Bake for 20 minutes or until golden – keep an eye on them during the last 5 minutes. Carefully lift the pies out with a blunt knife and allow to cool on wire racks. Dust tops lightly with icing sugar. Please consider this an invitation to tell us your stories of favourite festive foods, share a recipe, or link to some of the amazing culinary creations out there in internet-land. ‹ Friday Hoydens: new Hoyden authors! The Christmas before last we got all motivated and made a gingerbread house. Always one to push the envelope, the wee fella has decided that this year that won’t do. So we will be making a gingerbread castle tomorrow. How do I get myself into these things? I have vague plans for Angry Birds themed gingerbread this year, but I have no one but myself to blame for that. When I was little, my mother used to talk about how she missed the shortbread her mother made – the recipe had died with her in 1969. About 20 years ago, she was chatting to some friend of the family, and once again lamenting the loss. Said friend claimed that she was sure some other person had been given the recipe. Some time later, the recipe was tracked down and handed to Mum. However, it was ingredients only. My uncle was a pastry chef, and he spent about 12 months on and off trying to work out how to cook it so it tasted like his memory. Then he told me. I still needed to tweak it for my oven and my tin, but Mum is happy with the outcome. Now it’s a Christmas staple. Since my grandmother gave it away, I guess she’d be OK with me sharing. Rub butter into flours & sugar until it resembles breadcrumbs. Press mixture into a lamington tin – and when I say press, I mean seriously press, with a rolling pin. Score lines to make small pieces and press half a blanched almond into each piece. Bake at 130 deg C for about an hour. The top will stay quite pale, but the almonds make a reasonable marker for cookedness. The inside should go a golden brown colour. BTW, I don’t know what the standard measurements for a lamington tin are, my tin is quite small – about 12 x 18cm or so. It makes thick shortbread – about 1.5-2cm thick. Cooking times will vary massively with tin size, so you’ll need to experiment. This does look delicious and I’ve never tried mince pies before, though they are definitely representative of the season…might just have to give this recipe a try! I’m not much of a sweets person (give me the cheese platter nearly every time) but I can vouch for the deliciousness of mimbles’ mince pies. shonias, your shortbread sounds marvellous and something that even a poor baker as myself should be able to manage. Beppie, are you going to share some of the secrets behind your Amazeballs Rum Balls? Orlando, gingerbread is a slippery slope . Be warned! And tigtog, I only eat mince pies with cheese (something solidly English like cheddar or cheshire). I blame my Yorkshire heritage. Ooh, Sunset, the Tiny Tyrant and I have decided what we’re taking to my family get-together on Christmas Day! that shortbread receipe sounds pretty much identical to the one I learned from my grandmother – with the additional of using carved wooden thistle molds to shape the dough (heavily flour the molds with rice flour, press in the dough firmly, tap them out onto the baking sheet) I have a largish mold, about 6 inch diameter, which is very very old and a smaller mold (say 2 3/4 inch) which is about 20 years old and was brought back from Scotland. I always seem to end up making a summer pudding for Christmas (I’m not that fond of them, but Mr angharad and the in-laws love them). Traditionally they are made with bread, but I like to make them with sponge cake. 1 kg fresh mixed berries (raspberries, strawberries, blackberries, cherries etc) or 2-3 packets of frozen. If the berries are fresh cut them up roughly and put them in a saucepan with a couple of tablespoons of water. If you are using frozen just put them straight in the saucepan. Sprinkle with a little sugar (or don’t) and heat until the berries are mushy and lots of juice has come out of them. Meanwhile take a 1.5l pudding basin (or mixing bowl). Cut a small circle from the sponge cake to fit in the bottom. Cut a large circle to fit the top (although you may want to leave this to the end to make sure it fits properly. Cut the remaining spongecake into strips and wedges to fit round the sides of the basin. You want a nice tight fit with no gaps, so that the whole basin is lined with sponge cake. Take all the pieces of sponge cake out and set them aside. Drain the juice from the berries and put it into a wide, shallow bowl. Dip the pieces of sponge cake in the juice (you just need to dip one side) and replace in the basin juicy side out. Once you have lined the bottom and sides of the basin completely, pour the berries into the middle. Then dip the top and fit that in. If there is not enough juice you may need to dilute it a bit, or mix in some bottled juice. Cover the top with cling wrap and press it all down tightly. Refrigerate for several hours and preferably overnight. Then you should be able to turn the pudding out onto a plate. It will have that lovely pudding basin shape, and be bright pink/purple all over. Serve with lots of whipped cream, ice-cream and/or custard. Once the gingerbread Tardis becomes easy, there’s the gingerbread Serenity. Because I’m Scandinavian, my Christmas baking revolves around pebbernødder, brune kager, and one year I made klejner (deep-fried, and therefore very incompatible with Australian Christmas season, at least in my kitchen). When I was in the US, I added snickerdoodles to my repertoire. The benefit of these recipes is that the dough has to rest a while, so I watch the weather forecast and bake early in the morning of a cool day. I enjoy mince pies etc, but for me part of the fun is that I make my traditions and my friends make theirs and we all get more types of nom to share. My go-to Christmas cooking is usually chocolate truffles. I have a cookbook (Women’s Weekly All-Time Favourites) which has directions for how to make a truffle “tree” for Christmas decorating/centrepiece needs. I got all carried away a few Chrimbles ago, back when we didn’t have much money, and made up various recipes of truffle and shared them around with the extended family. Everyone loved them, so I keep making them every year. This year, however, I’ve been rather distracted what with one thing and another, and Himself is rather insistent on actually giving “proper” presents this year, because we can afford it for the first time in about half a decade. However, I present for all and sundry my adaptation of one of the recipes, to give Dark Chocolate Rum & Raisin Truffles. 1 week before you start: Soak 1/3 cup raisins in about 2 tablespoons of dark rum. Turn daily, to ensure even soaking. Bring cream to boil in small pan, pour over dark chocolate in small bowl, stirring until chocolate melts. Stir in liqueur and raisins. Cover, refrigerate, stirring occasionally, about 30 minutes, or until mixture starts to thicken but does not set. Roll rounded teaspoons of mixture into balls, place in single layer on tray; refrigerate truffles until firm. According to the book, this recipe makes around 35 truffles. I’ve never really gotten that many out of it. The book goes on to recommend coating the formed truffles in melted dark chocolate. I’ve never figured out how to do this without either getting bits of truffle in the chocolate, so I tend to go with just coating them in chocolate sprinkles. The basic truffle recipe is fairly easy to adapt (the original was Hazelnut and Irish Cream – chopped hazelnuts instead of raisins, Irish Cream instead of rum). Pick a combination you like and play around. I have been tempted by both TARDIS and Serenity gingerbread creations, but I think I’ll content myself with admiring pics. Speaking of pics, Orlando, I hope you’ll be sharing the castle building results? Shonias’ shortbread is yummy, so are her brownies, it’s definitely a good thing when friends and family make different things – variety is delicious! Um, carefeul consideration is recommended before starting the gingerbread house tradition. We made the first one sixteen years ago, for the eldest grand daughter (then 18 months old), and have made ‘em ever since. Because daughter and family live 11 hours driving away, and we are seldom all together for Christmas, for the last six years we have made two houses. The one for daughter’s family travels in ‘kit form’ and is assembled and decorated the morning after our arrival. Last year the decoration of the ‘kit house’ was completely in the hands of the two youngest grandchildren, and they were stoked! My mum always used to make a traditional English plum pudding, but in later years has become quite fond of TV chef variations that better suit the Aussie summer climate: plum pudding ice cream being an absolute belter. Don’t have a particular recipe to recommend, but I’m sure that search engines are one’s friend.